There’s a problem in healthcare IT security: incomplete or infrequent software updates and patching that leaves operational and clinical systems vulnerable to cyber threats. In fact, it takes 102 days on average to roll out security patches in healthcare orgs, per 451 Research. Hospitals can fall behind in updating their software for various reasons. These include the lack of a dedicated staff, to little on-site cybersecurity expertise, to the time and effort needed to test patches before rolling them out to production systems. 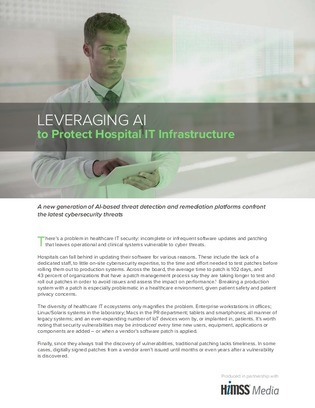 Download this resource to learn about a new generation of AI-based threat detection and remediation platforms that hospital IT infrastructures need to protect the rise in electronic health records.